Community Colleges are pivotal institutions in American society—crucial to our economic competiveness and our efforts to revive the American Dream. As open-access institutions located close to where students live and work, community colleges are uniquely situated to jumpstart social mobility for those who aspire to the middle class. That is why President Obama has called for making community college free and the first two years of college universal, just as primary and secondary education have been for decades. Yet, the outcomes today at community colleges are often dismal. While 81 percent of first-time community college students say they wish to earn a bachelor’s degree or more, after six years,1 only 12 percent do so; two-thirds fail to get even an associate’s degree or certificate after six years. With 86 percent of high school graduates going on to college,2 the central challenge in higher education has shifted from access to college to something different: access to high-quality programs that have the support to ensure graduation. Given these low completion rates, new accountability measures are coming to higher education—as they should. States are adopting performance-based funding, the Obama administration is proposing a college rating system, and a Brookings Institution scholar recently recommended a No Child Left Behind Act for higher education.3 But as we apply accountability to colleges and universities, we need to make sure institutions have sufficient resources to succeed. We often hear the mantra that community colleges need to do more with less; but if we really care about invigorating the promise of two-year schools, why should we accept that artificial limitation? As we will see below, research suggests that targeted investments can produce substantially better educational results than we see today—which will pay crucial dividends for society at large. This issue brief looks at three key issues surrounding the funding of higher education: (1) What are the overall variations in spending between community colleges and four-year institutions, and do the justifications advanced for those differences hold up? (2) Are the current (relatively low) levels of funding at community colleges efficient, or inefficient? (3) Does it make sense to move toward a K–12 style system of “adequacy” funding in higher education, where public funding would be weighted toward institutions such as community colleges, which educate large numbers of low-income students? How would such a system work? A program of funding weighted toward low-income students in higher education would be a far cry from what we have today. Community colleges educate students with the greatest needs, on average, yet spend far less per pupil than four-year institutions. As The Century Foundation’s 2013 task force report on community colleges documented, this inequality persists even when one separates out the research function of universities and focuses exclusively on educational instruction.4 And it remains true even when one accounts for the fact that the first two years of college are generally less costly than the third and fourth. The current approach—trying to educate low-income and working-class students on the cheap—ends up being highly inefficient, because while the costs of community college are relatively low, low completion rates at these schools mean the costs per degree or certificate are high. 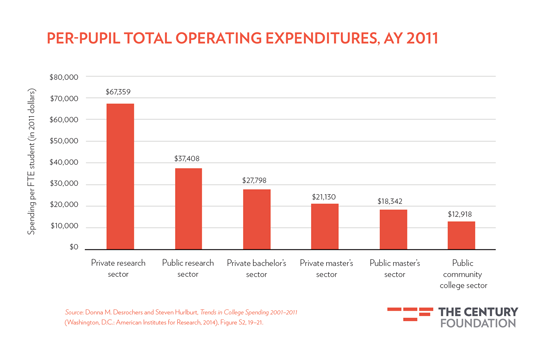 Per-pupil operating expenditures vary dramatically, as Figure 1 shows. In raw numbers, private research universities spend five times as much per student as community colleges, and public research universities almost three times as much. Three major justifications are offered for this differential, but each fails to fully justify the disparities. First, research universities are charged not only with educating students, but also with conducting basic research that advances human understanding of the world. This valid point takes us only so far, though, because when scholars separate out research and include only education and related expenses, large gaps in expenditures remain between institutions, as Figure 2 shows. Even if one thinks the gross inequalities in spending and subsidies are perfectly justified, the growing gap in spending over time seems hard to defend. 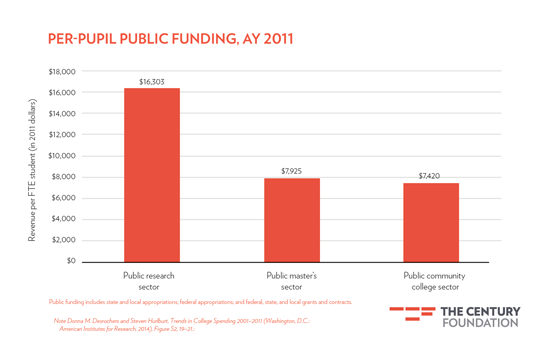 In the period from 2001 to 2011, as Figure 5 shows, funding increased substantially at public and private research universities, while public community colleges actually saw a $904 decline in real funding. These inequalities are particularly difficult to swallow, given the evidence (which we present below) to suggest that community college students on average have greater—not fewer—needs than four-year college students. Some may argue that the current system—which allocates many more resources to four-year institutions—is efficient because the most funds are spent developing the talents of those students (of whatever race and class) who succeeded at the K–12 level, won slots at four-year colleges, and are likely to contribute the most to society in the future. Students who have been less successful in society’s meritocratic race, the argument runs, should be educated more cheaply in the community college system. In fact, educational opportunities in primary and secondary schooling are vastly unequal, so we can have little confidence that the “meritocratic” winners by the end of high school are indeed society’s most able. Moreover, many highly able low-income students “undermatch,” attending community college even though they have the academic credentials to attend a selective four-year college.16 The current system then compounds this inequality and inefficiency by educating low-income students on the cheap in community college. In so doing, we often waste the talents of those students who could contribute a great deal to our society, but who are failed by our grossly unequal two-tiered system of primary, secondary, and tertiary education. 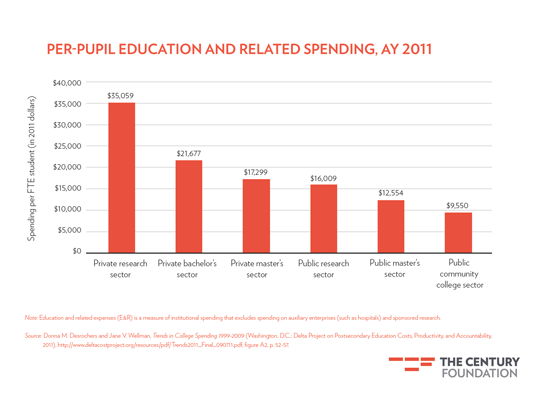 What would a more equitable and efficient system of higher education funding look like? The K–12 system—which has greater experience educating disadvantaged students and has lower dropout rates than higher education—may be informative.27 Considerable K–12 research has been conducted at the state level to estimate the cost of an “adequate” education, and a key finding of that research is that a funding premium needs to be provided for low-income elementary and secondary students to be successful. At the K–12 level, two-thirds of state funding formulas recognize that students with greater needs deserve greater resources.31 And the federal Title I program within the Elementary and Secondary Education Act is based on the premise that schools with concentrations of student poverty deserve extra funding. Federal aid that goes directly to institutions also tilts toward the wealthy. According to a May 2009 Brookings Institute report, four-year institutions received nearly three times as much aid ($2,600 per student, including financial aid) as community colleges ($790).40 Meanwhile, as outlined above, state aid to institutions often tilts toward flagship universities, which educate a disproportionate number of wealthy students, and away from community colleges, which educate large numbers of disadvantaged students. And some of the largest federal and state subsidies—up to $105,000 per student—come in the form of tax breaks for four-year colleges with large endowments. But broadly shared outcome measures are beginning to emerge in higher education. Today, more than half of states employ performance-based funding for higher education, meaning they provide some portion of funding based on student outcomes, according to a 2015 report of the National Conference on State Legislators.42 As states have adopted outcomes-based funding, they have necessarily devised standards of success that offer benchmarks to which higher education “adequacy” funding can be tied. Likewise, as outcomes-based funding becomes more popular, states are experimenting with financial incentives to ensure that institutions continue to serve low-income populations.46 This weighted funding for low-income graduates implicitly recognizes that it may be more difficult—and expensive—to successful educate at-risk students. Tennessee is considered to be at the vanguard of outcomes-based funding, and it provides a substantial financial premium for success with low-income students. In 2010, at the urging of Governor Phil Bredesen (a moderate Democrat), the legislature passed the Complete College Tennessee Act, to replace college funding based on student enrollment with a program funding success as measured by various outcomes such as retention rates and completion. The act called for a “fair and equitable distribution and use of public funds” to guide the outcomes-based model. It is long past time for the United States to modernize its haphazard, inequitable, and inefficient system of higher education funding. Federal and state governments have roles to play in promoting reform, as does the philanthropic community. At the federal level, progressive congressional action is unlikely in the short term, but the executive branch could take action in the near term that would lay the groundwork for critical reform over time. What should be done? First, the U.S. Department of Education—or a group of foundations—should support rigorous research to better identify the full level of funding each higher education institution currently receives. When you cobble together the federal, state, and local subsidies—both direct expenditures and tax breaks (for institutions and individuals)—what does the total allocation of public support look like? Once we have a clear and systematic accounting—from Princeton’s $105,000 per student subsidy to Essex County College’s $2,400—we will be able to accurately evaluate whether the current distribution between community colleges and four-year institutions, and between low-income and affluent students, is equitable and efficient. Second, we need a better understanding of what it takes to educate the more-disadvantaged students to high levels. State performance funding formulas—which provide 40 percent (or even 100 percent) more for success with low-income students—could provide a model for increasing needs-based funding for Community College students. The Century Foundation’s Community College Task Force was right to call for a rigorous federal study of how much weighting low-income college students deserve.62 Failing that, foundations could fund this important research so that we will have a stronger basis for making policy decisions about the allocation of public dollars. As the nation becomes more racially, ethnically, and economically diverse, we can no longer afford to write off large chunks of our population. Providing adequate levels of funding to educate students of all backgrounds is a critical step in helping community colleges fulfill their original promise of serving as engines for social mobility. , (New York: The Century Foundation Press, 2013), 12. 2. James Rosenbaum, Caitlin Ahearn, Kelly Becker, and Janet Rosenbaum, The New Forgotten Half and Research Directions to Support Them (New York: William T. Grant Foundation, 2015). 3. Harry Holzer, “Should There Be a No Child Left Behind Act for U.S. Universities?” Brookings Institution, April 13, 2015. 4. Bridging the Higher Education Divide, 24. 5. Sandy Baum and Charles Kurose, “Community Colleges in Context: Exploring Financing of Two and Four-Year Institutions,” in Bridging the Higher Education Divide, 82. 6. Ibid., 97 and 102. The authors calculate that private research universities spend 5.63 times more, and public research universities spend 2.014 times more for education and related expenses than community colleges. This is a larger differential than the upper division/lower division distinction would explain. 8. Christopher M. Mullin and David S. Honeyman, “The Funding of Community Colleges: A Typology of State Funding Fomulas,” Community College Review 35, no. 2 (October 2007): 113–27, at 117. See also Christopher M. Mullin, Doing More with Less: The Inequitable Funding of Community Colleges (Washington, D.C.: American Association of Community Colleges, September 2010), 6. 9. Baum and Kurose, “Community Colleges in Context,” 91. 10. Jorge Klor de Alva and Mark Schneider, Rich Schools, Poor Students: Tapping Large University Endowments to Improve Student Outcomes (Chandler, Ariz.: Nexus Research and Policy Center, April 2015), 1. 13. Donna Desrochers and Steven Hurlburt, Trends in College Spending: 2001–2011 (Washington, D.C.: American Institutes for Research, 2014), 17–18. 14. De Alva and Schneider, Rich Schools, Poor Students, 7, Table 1. 15. Alicia C. Dowd and John L. Grant, Equity and Efficiency of Community College Appropriations: The Role of Local Financing (Ithaca, N.Y.: Cornell Higher Education Research Institute, January 2006), 2, 15. 16. Caroline Hoxby and Christopher Avery, “The Missing ‘One-Offs’: The Hidden Supply of High-Achieving, Low-Income Students,” Brookings Papers on Economic Activity (Washington, D.C.: Brookings Institution, Spring 2013), 1–50, http://www.brookings.edu/~/media/projects/bpea/spring-2013/2013a_hoxby.pdf . 17. Bridging the Higher Education Divide, 30. 20. Mark Schneider, and Lu Yin, The Hidden Costs of Community Colleges (Washington, D.C.: American Institutes of Research, October 2011), 2. 21. Rosenbaum, Ahearn, Becker, and Rosenbaum, The New Forgotten Half and Research Directions to Support Them, 5. 22. Bridging the Higher Education Divide, 38. 23. Ashley A. Smith, “Survey shows participation in online courses growing,” Inside Higher Ed, April 21, 2015. 24. Susan Dynarski, “How to Improve Graduation Rates at Community Colleges,” New York Times, March 11, 2015; and Katherine Mangan, “Program’s Extra Support for Community-College Students Is Paying Off,” Chronicle of Higher Education, February 26, 2015. 25. Bridging the Higher Education Divide, 35–40. 26. Baum and Kurose, “Community Colleges in Context,” 74. 27. Bridging the Higher Education Divide, 11. 28. Bruce Baker, Lori Taylor, and Arnold Vedlitz, Adequacy Estimates and the Implications of Common Standards for the Cost of Instruction, Report to the National Research Council, May 30, 2008, 4–5. 30. 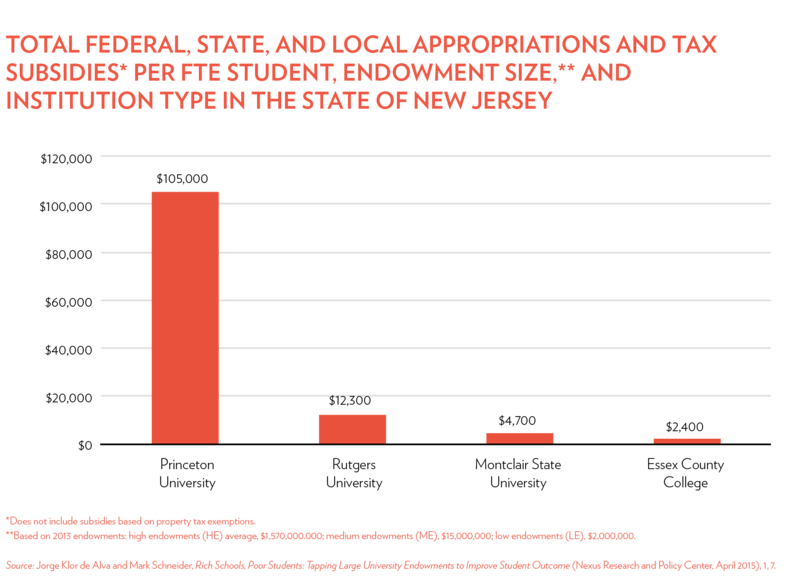 Natasha Ushomirsky and David Williams, Funding Gaps 2015: Too Many States Still Spend Less on Education Students Who Need the Most (Washington, D.C.: The Education Trust, March 2015), 5. 31. Bridging the Higher Education Divide, 17. 32. Ushominsky and Williams, Funding Gaps 2015, 4, Figure 1. 33. Emma Brown, “In 23 states, richer school districts get more state and local funding than poorer districts,” Washington Post, March 13, 2015, A18. 34. Bridging the Higher Education Divide, 76–77. 35. De Alva and Schneider, Rich Schools, Poor Students, 11 and 21. 36. Bridging the Higher Education Divide, 18–19. 37. Charles B. Reed and F. King Alexander, “We Need a New Kind of Institutional Aid,” Inside Higher Ed, March 30, 2009. 38. New America Foundation, Federal Education Project (2014), cited in De Alva and Schneider, Rich Schools, Poor Students, 5. 39. Jon Marcus, “Wealthier students more likely than poor to get private scholarships,” Hechinger Report, April 17, 2015. 40. Sara Goldrick-Rab, Douglas N. Harris, Christopher Mazzeo and Gregory Kienzl, “Transforming America’s Community Colleges: A Federal Policy Proposal to Expand Opportunity and Promote Economic Prosperity,” Brookings Policy Brief, May 2009, 1 and 3. 41. In 2003, a California working group reported, “No state has seriously attempted an adequacy-oriented Quality Education approach to postsecondary funding.” Chancellor’s Office, California Community Colleges, The Real Cost Project: Preliminary Report (September 2003), 9–10, http://californiacommunitycolleges.cccco.edu/Portals/0/Reports/realcost.pdf. 42. National Conference of State Legislators, “Performance-Based Funding for Higher Education,” January 13, 2015. 47. Martha Snyder, Driving Better Outcomes: Typology and Principles to Inform Outcomes-Based Funding Models (HCM Strategies, April 2105), 9. See also Paul Fain, “Report seeks to add specificity to debate over states’ performance-based funding models,” Inside Higher Ed, February 12, 2015. 48. Snyder, Driving Better Outcomes, 22–23. 51. See Dennis P. Jones, Outcomes-Based Funding: The Wave of Implementation (National Center for Higher Education Management Systems, October 2013), 4. (citing Texas). 52. Postsecondary Analytics, “What’s Working? Outcomes-Based Funding in Tennessee,” October 2013, 1. 53. Russ Deaton, Tennessee Higher Education Commission, “Tennessee’s Outcomes-Based Funding Formula,” http://www.tn.gov/thec/Divisions/Fiscal/outcomes_resources.shtml. 54. Ibid., 2 (“A 40 percent premium is applied to these outcomes as a way to recognize the added assistance provided to these populations and the importance of success for these populations to state goals”). 55. See Postsecondary Analytics, “What’s Working?”; and Frank Woodward, “Do Performance Funding Policies Impact Higher Education Outcomes,” American Society for Public Administration, March 24, 2015. 56. Richard Rhoda, Tennessee Higher Education Commission, e-mail to author, May 8, 2015. 57. In 2013, the Ford Foundation approved a $500,000 grant to the Tennessee Higher Education Commission to “evaluate the effects on campus of the state’s new outcomes-based funding formula for public higher education and develop Web-based reporting and analysis tools.” See Ford Foundation website, http://www.fordfoundation.org/grants/grantdetails?grantid=119506. 59. Irish Higher Education Authority, National Plan for Equity of Access to Higher Education, 2008–2013, July 2008, 48. See also Irish Department of Education and Skills, National Strategy for Higher Education to 2030, January 2011, 114–15, 122. 60. Irish Higher Education Authority, External Audit of Equal Access Survey, June 2010, pp. 7–8, 16. 61. Arthur M. Hauptman, “Using Institutional Incentives to Improve Student Performance,” in Double the Numbers: Increasing Postsecondary Credentials for Underrepresented Youth, ed. Richard Kazis, Joel Vargas, and Nancy Hoffman (Cambridge, Mass. : Harvard Education Press, 2004). 62. Bridging the Higher Education Divide, 39. 63. De Alva and Schneider, Rich Schools, Poor Students, 2 and 14–16.